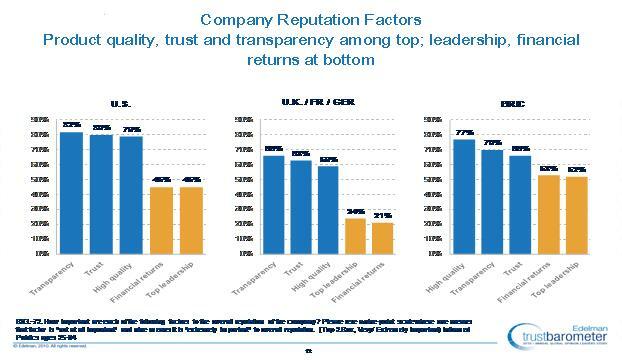 Trust is back but it is fragile this is the top line from the latest Edelman TrustBarometer. Perhaps this recovery was to be expected but more remarkable is the continued rise of the Trust within the technology sector which globally rose from it’s previous chart topping 78% to 79%. This leadership was consistent in local findings with unprecedented ratings in certain markets reaching as high as 93% in the Netherlands and 91% in Italy. Even more notable was that this leadership is now a clear trend over 4 years. I have wondered aloud before about why this should be but there are some clues within the data this year and 3 key points strike me as relevant. The Technology Industry’s Products Help US: There is a powerful assumption that technology companies are Trusted because they help make our lives better if not easier. The data in this year’s Barometer shows that it is the quality of products and services that remains the top driver for trust while innovation slipped it remained in list of key reasons that build trust again this commitment to innovation is central to technology company’s mission. I believe this quality imperative also combines with an technology industry commitment to reduce the price of products through innovation. This may well explain why technology is more trusted than healthcare another industry that clearly helps people but has not as systematically delivered price reductions. Imagine if the scale of price reductions delivered in the manufacture of PCs was replicated in the government sector. Better performance for a third of the price within a decade may be the answer to renewing trust in government. Technology Is A Stakeholder Model: When I rasied this question of why technology was trusted six months ago a number of comments highlighted the structure of industry as a driver for Trust. Specifically the industry’s need to interact with an ecosystem and take a stakeholder based approach to collaboration from partners to academics and government. This year’s data shows that it exactly this stakeholder approach that is an engine for Trust. The chart below shows that the majority of respondents see trust as deriving from a equal treatment of key stakeholders. 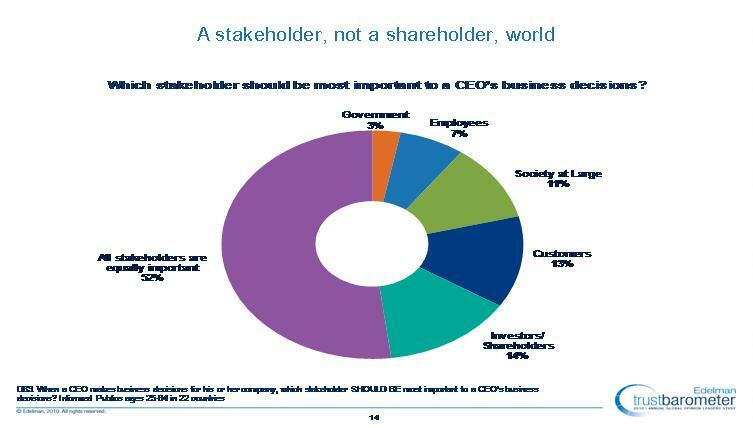 Clearly the technology industry has benefited from combining a shareholder approach with a stakeholder approach. Technology is a future looking Industry: Technology companies have focused on future looking messages and experience suggests that it is this kind of positive story telling that helps build trust. Furthermore technology has kept an optimistic and youthful image it will be interesting if this image can be survive Californian bankruptcy and government challenges. In the past the key to this success has been the model originating in silicon valley of working with universities, experts and thought leaders to keep predicting and anticipating the future. Again data from the trust survey shows that working with experts, academics and analysts is the key to trustworthiness today. I believe that the technology industry has essentially got it’s relationships and stakeholder approach right but this should n’t encourage complacency. The rebound in trust is clearly fragile and trust has clearly changed. 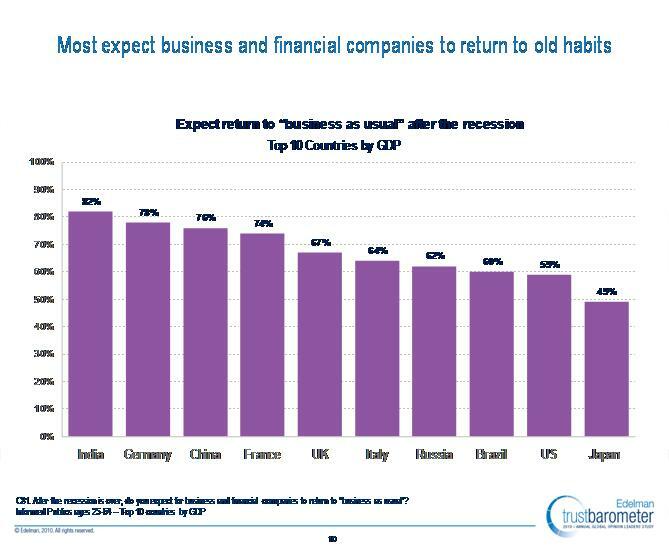 The elites surveyed are skeptical about whether business really will change and clear that change is needed as shown in the slide below they believe industry will return to it’s old practices. If the technology industry is to maintain it’s trust dividend then it needs to continue to innovate not just with it’s products but with it’s engagement strategy deepening the stakeholder commitment and treating trust as a key driver of future business. I would suggest that the level of trust in regards to Healthcare will be increasingly fascinating and hard to predict within the U.S as healthcare reform continues to be strongly debated. As the governmental level of control increases in healthcare, as laid out in the current Democratic healthcare plan with a public option originally debated (although now scrapped as it did not garner appropriate support), the perception of healthcare could begin to be strongly linked to the level of trust of government. Realistically it will actually be linked to the trust of government far more than it in fact should be if the Republican’s continue to portray the healthcare reforms as “government control of healthcare”, purely for their political agenda – creating a false perception of control. Therefore the future of trust in healthcare could become increasingly intertwined with the level of trust in government, both being able to shape the other. In the 2010 Trust Barometer the level of trust in the U.S government had risen to 46%, a big climb from a year earlier, but still far lower than the 60% that Healthcare rose to in 2010, maybe leading one to fall, one to rise, or a meet in the middle. Obviously it would not be right to suggest that people will act the same way when considering the trust in government and trust in an industry as they can be seen to offer very different services and play quite separate roles in society: This is potentially illustrated in the high level of trust in the technology industry, despite playing a large role in California where the government is in a deep financial mess, which may point towards the ability for people to identify difference between industry and government. But this example is not on a national scale so cannot necessarily be used to generalise about the movement of public opinion and it will be interesting to observe how the perception of the entire U.S healthcare system changes as belief of government interference in the industry increases. With Barack Obama refusing to scale back his healthcare proposals, as many expected him to do last night in his ‘State of the Union’ address, the debate looks set to continue: Is trust in healthcare going to begin to mirror trust in government in America if Obama can push through his reforms? David as you say it will be fascinating watching the trust landscape as the legislation develops taking the healthcare debate into uncharted territory. Two observations firstly that the UK which has one most socialised systems in the Western World sees Trust in healthcare move between 59 and 69 % over the last 4 years consistently higher by over 20 points than trust in government. It seems the relationship between government trust and industries controlled by the government policy is complex. Secondly there has been a long relationship between the technology sector and the government. The Internet was developed by government and academic agencies for instance but does not appear to have imapcted on the trust levels within the industry. I would argue that the U.K is a poor comparison to use because of the historic background of the NHS and the length of time that healthcare has been publically available here, leading to normalisation and apparent seperation between government and healthcare. The U.S, on the other hand, is a country that has an almost visceral reaction to government intervention of healthcare, clearly demonstrated by the increasing support for the ‘Tea-party movement’ and the large-scale protests against what is actually a fairly minor set of reforms. I would also argue that whilst the government has a great deal of influence in the technology sector, and it is true that the trust in technology has not mirrored government levels, technology is seen by many as a completely seperate field to healthcare. Not only can it be viewed in a cold and detached way, in a way that the human-face of healthcare cannot, it is also something that people see the benefits of and rarely the failures (how many firms actively publicise technology failures in the course of their pioneering research), whereas in healthcare they are often widely available and lamented facts. To try to draw comparisons between healthcare and technology is too flawed to use as an appropriate comparison. Good points and as you say the really key element is government involvement across a range of industries is likely to throw up a potentially fascinating changes in local trust landscapes in US,UK and beyond. 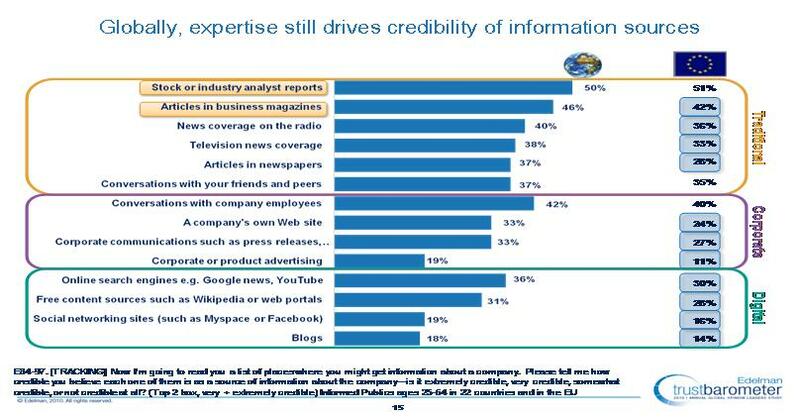 ok, my number one concern with the data is whether the ‘elites’ questioned are thinking about B2C technologies or B2B. Obviously incessant hype around Apple ‘iEverything’ and other consumer facing brands does back it up, but watching the enterprise IT market a lot of commentators have been asking serious questions about the relationship between customers and their suppliers. Thomas Wailgum has bluntly asked whether Oracle and SAP are simply too big (http://bit.ly/dnSY79) while the saga around suggested changes to the SAP support contract has left a bad taste for some (http://bit.ly/csZp8j). In both situations that contrasts with this notion of tech companies underlining their commitment to customers through innovation. And for me that means how trusted they are comes into question. I think the general point about consumer and b2b technology highlights one challenge of researching technology as an industry, namely that it is really a conceptual term. In reality the sector is made of many quite different industries that interact with the world and trust in different ways. I would be skeptical if trust in telecoms was as high as trust in ‘technology’. Any thoughts? As long as the FDA continues to push pharmaceuticals into the market in the US before theie side-effects have been exhaustively researched, I think that Americans will remain wary of the healthcare industry (as compared to other sectors). Not to mention the fact that this sector sees a lot of lobbying done on its behalf in Washington. This generally raises suspicions in the US… as sometimes lobbysists don’t have he general public’s best interest at heart. It would be interesting to see how these sectors are perceived from country to country. I’m sure that we would find some interesting variations….